Discussion in 'Edged Tools' started by HeavyMetals9, Sep 11, 2012. I just bought a BK2 from Hugins, havnt received it yet but he had stripped the black coating and put a forced patina on it. Im new to this and have done some research and watched vids on youtube but would like some of your opinions on this. Do you do it? Do you believe it helps or just for looks? I have to say I do like some of the designs Ive seen. 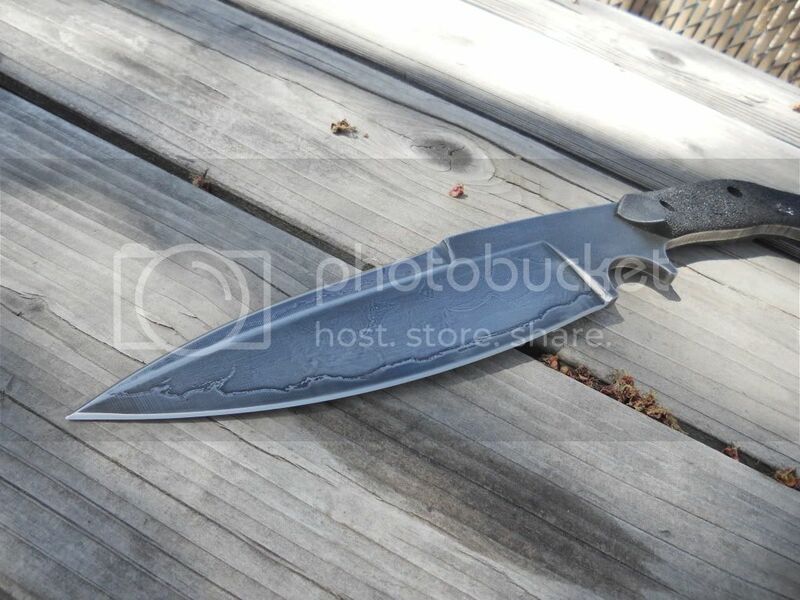 Does it require resharpening or reshaping the blade afterward? If it doesnt turn out to my liking can it be polished out and done over again. Thanx. If I am restoring an axe or knife and completely strip it with vinegar I patina the blade. It does help, since it is a form of corrosion. It will help to stop carbon steel from rusting. I think it looks pretty cool also, so that is an added bonus. For your question about resharpening I keep all of my edges polished sharp. So there is no patina on the edge. This will happen just by you keeping your BK2 sharp. You could remove the patina with sand paper or vinegar but I would just leave it. It keeps the blade from rusting. I'm one of those weirdos who doesn't patina my carbon steel. I like to keep it bare and well rubbed with tallow. However, my brother has used boiled apple cider vinegar and gotten some heavy black patinas that seem to hold up well. Thanx all. Im anxious to get my BK2 and check it out. Some of the patinas Ive seen look similar to a damascus look. I dig it. I never knew you could force a patina. Another reason I love BCUSA. Im going to try it on some other knives myself. Ive seen some vids that say you can use mustard, vinegar, potatoes and citrus fruits. And the tiger striping is kinda cool but wondering which would give the best results? Which works for a dark patina as opposed to a lighter grey? Ive never been a big fan of blacked out blades. I usually prefer satin or polished and some stonewashed blades look decent. Thats why I was asking if a knife that has had a forced patina could be polished back out, in the case of getting a used knife thats had it done already or if I try it and dont like how it turned out. The more acidic the chemical used, the darker the patina. Vinegar leaves a light grey patina on the steels I've used it on. Citrus juices leave a darker patina. Mustard is nice because you can put it on in laces you want (BTW it's the areas of LIGHT coverage with mustard that patina). So mustard and/or cold bluing paste would be my choice for designs like pseudo damascus. If you are prone to getting rust on metal objects in your area and pattern of use, a forced patina will help protect the metal. If you just want to protect the blade while letting it develop character on its own, a vinegar patina will give a light grey look, and natural use will rub some of it off, other things will get on it and make it darker in areas, and a natural aged look will result. If you just just want it to look aged but isn't rust prone in your area, just use the hell out of it and it'll patina on its own. A patina will definitely provide protection and also looks nice IMO. 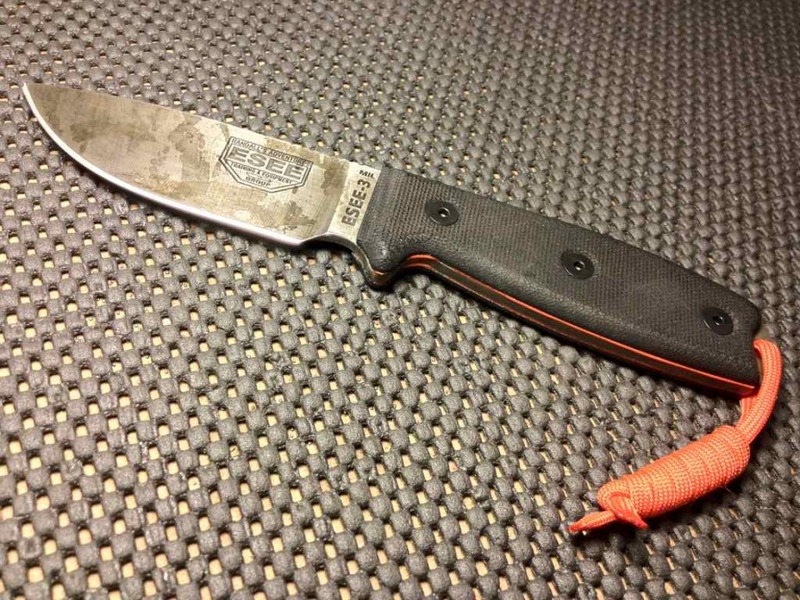 My ESEE-4 was done with vinegar. BHK Bushbaby done with mustard. turntail, Torrin, sea6ear and 1 other person like this. Hunley, how long did you leave that in the vinegar? 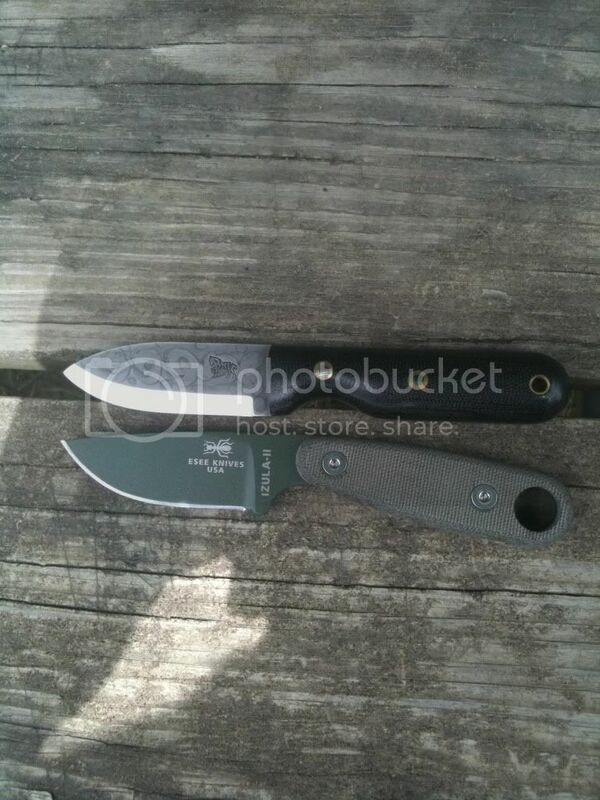 Hey, I recognize that Esee 4. Here's a few I've done in the past, including dhunley1's 4. Btw, PUGLIA, I believe I let it soak for just an hour or two at most...that knife "took the color" better than some others I've given the same treatment in the past. 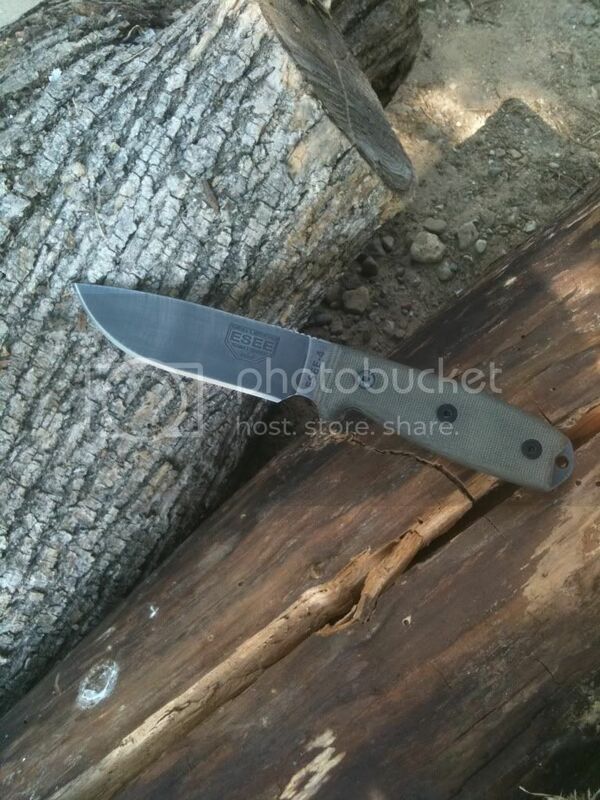 An Esee 3 I did, same treatment as above. turntail and sea6ear like this. martin_j001 actually did it for me. He responded just above. 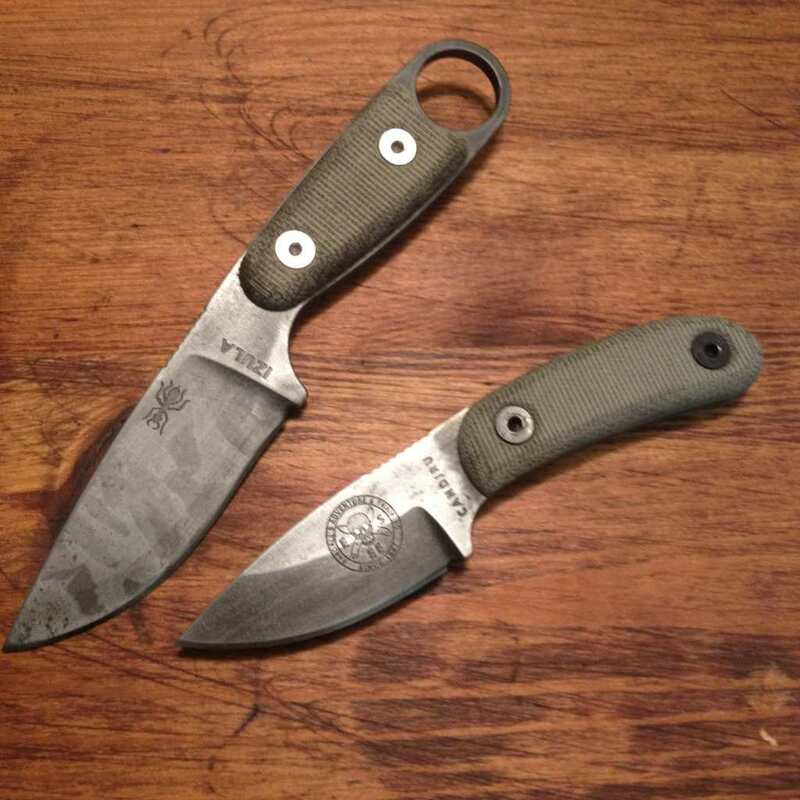 Question about this ESEE 4 - Is the ESEE logo etched underneath the protective coating they put on the blade? or did you etch that in yourself? 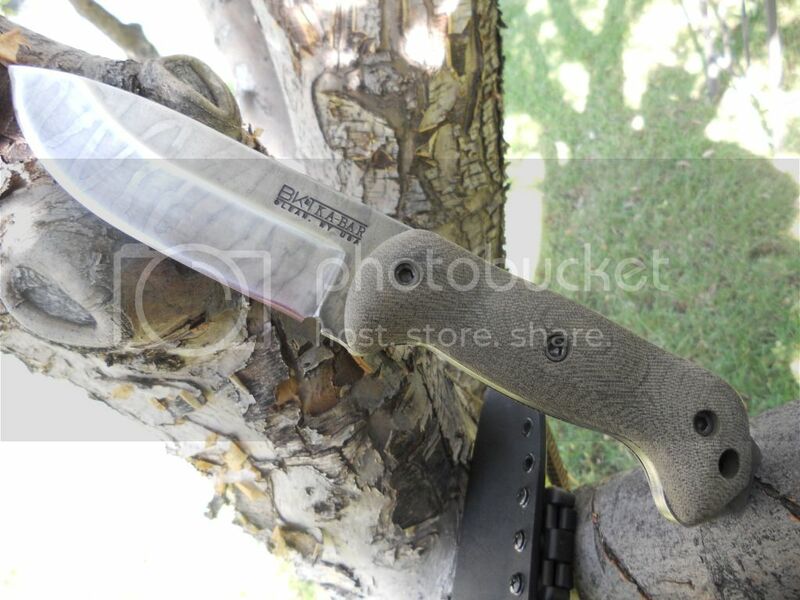 I would like to do this with my ESEE-3, but I don't want to lose the serial number. 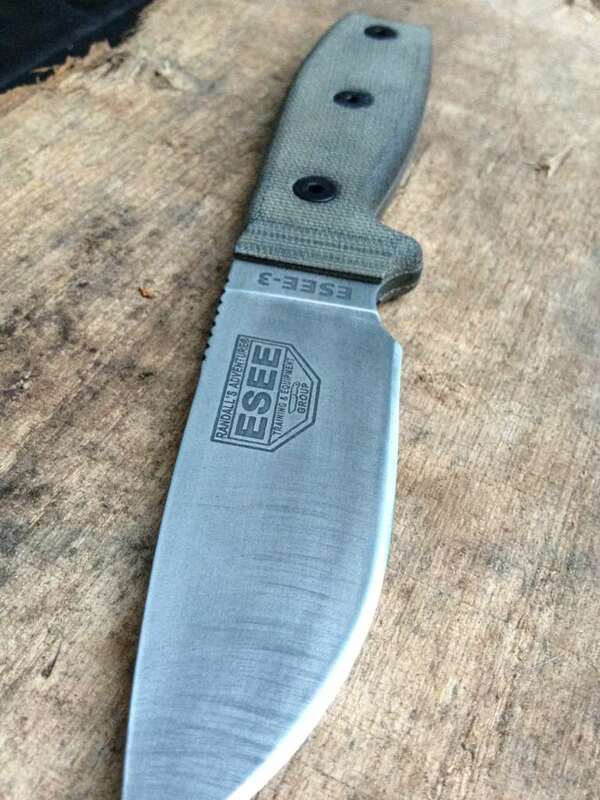 Question about this ESEE 4 - Is the ESSE logo etched underneath the protective coating they put on the blade? or did you etch that in yourself? As the guy who did the work on dhunley1's knife, I can tell you. The logos are visible on a stock Esee knife by the lack of blade coating, so I etched the logo first, and then stripped the finish off. 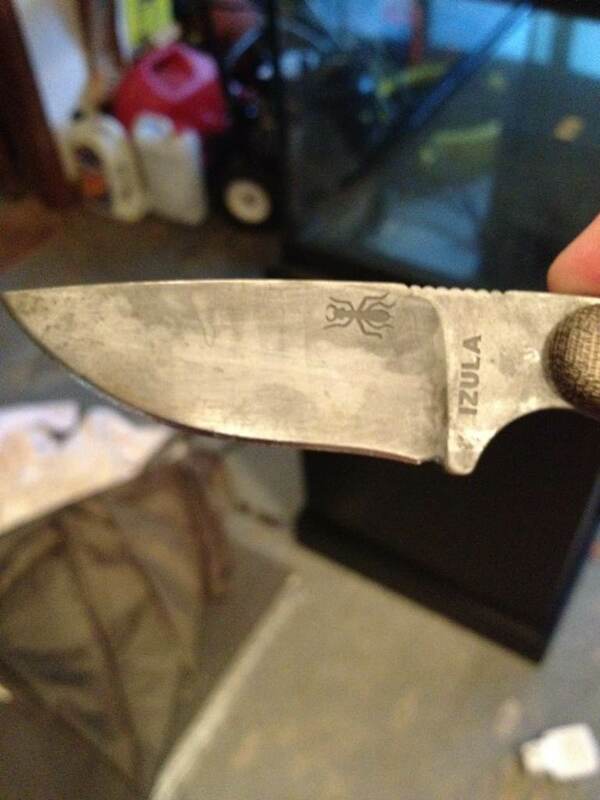 If you try to just strip the finish, you will have little to no logo left, and etching it at that point will do much more damage to the knife than anything else. hunley, I really like how dark the Esee turned out with vinegar. So you just soak it in a "bowl" of vinegar or do you have to use a cloth or paper towel? Also the Bushbaby with the mustard treatment is sick. Thats the damascus look I was referring to. But thats the part I dont get. Do you just "swirl" the mustard on the blade and leave it set? How long? Or is there another technique for the mustard? Just plain ol' mustard? Generic or premium? Sorry guys but Im very intrigued by this. 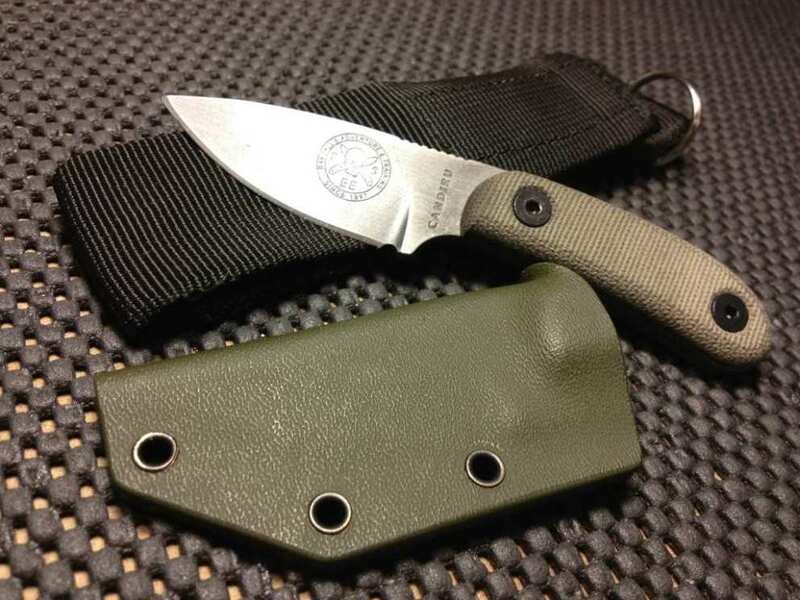 martin, how do you etch the Esee symbols on the blade and get them to look factory? 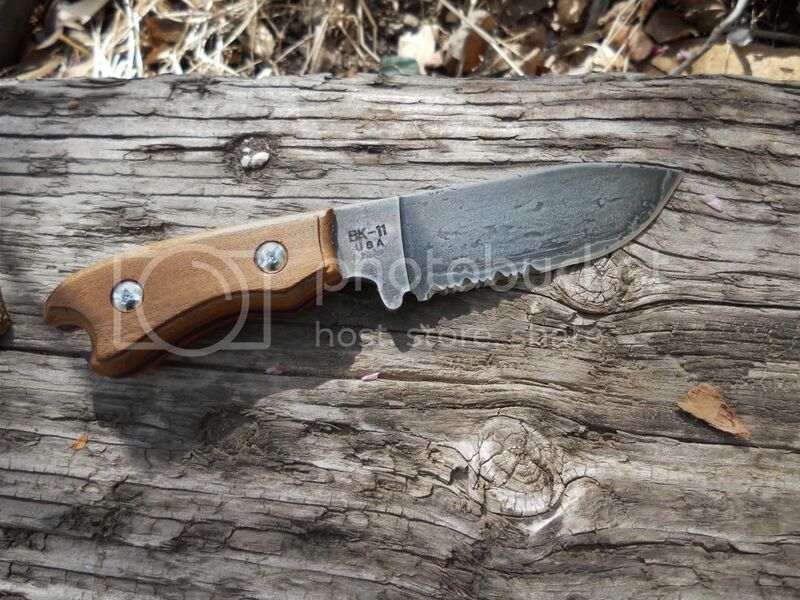 I'll let martin_j001 answer your questions in regards to the ESEE since he did it. As far as the mustard patina on the BHK, I just used plain yellow mustard. I swirled it on and let it sit for about 15-20 minutes and rinsed it off. I'm really happy with how it turned out. As for dhunley1's 4, I used a 2L coke bottle with the top cut off to be able to submerge the whole thing all at one time. turntail and Torrin like this. When I first got my BK-2 I gave it a patina using a base coat of A-1 steak sauce, followed by striping it with brown mustard. Here's how it looked right after. 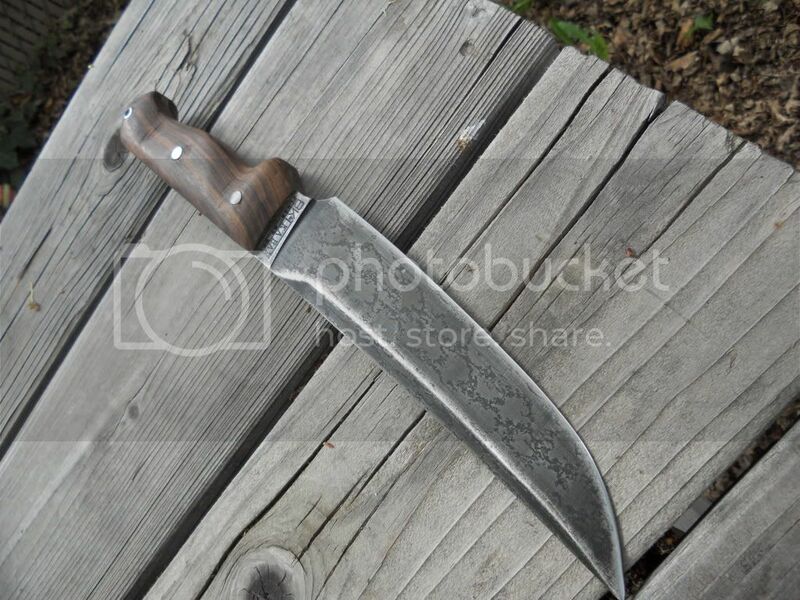 Here's how it looks now, after 8 months, a razor-sharp Fisked edge, micarta scales, and several campouts later. The patina has held up well. No rust at all. I've thought about redoing it, but I kind of like how it's aging. wasatchdan, that BK2 looks great! I really like how that turned out as well. Thats exactly what I would like to try on mine when it arrives. 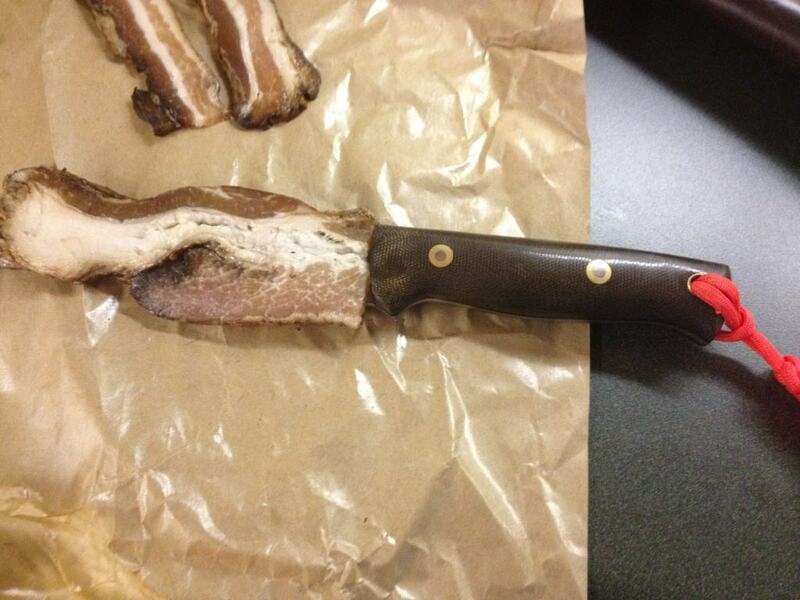 I want to try this on some of my knives now but Im not sure what knives it will work on. At this point in time I dont have any of the knives Ive seen this done too. This will be my first BK, when I get it, and hugins has already done the FP. Thats why I asked if it can be redone and would I have to polish it out first. I understand that it has to be a high carbon steel but cannot be a stainless steel right? 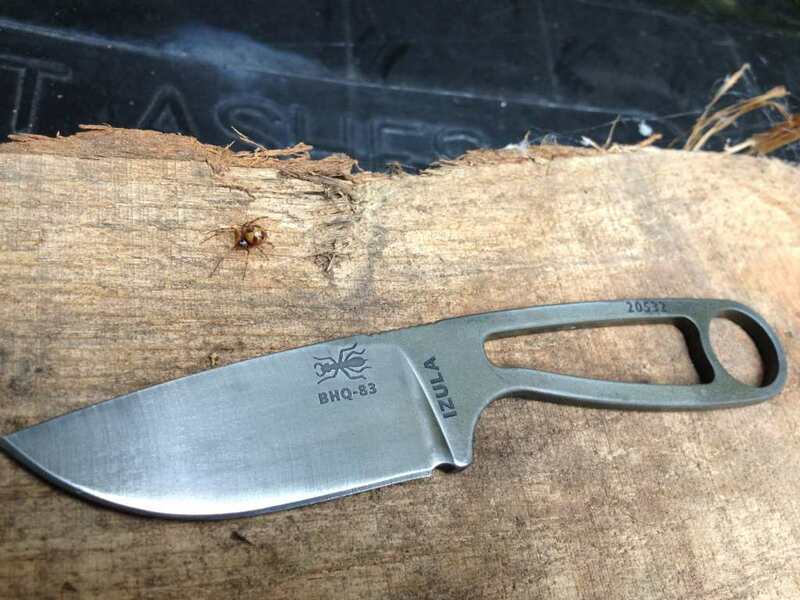 Can you give me some examples of lower cost knives this would work on? CS Bushman? SOG Seal Pup? Kershaws? Bucks? 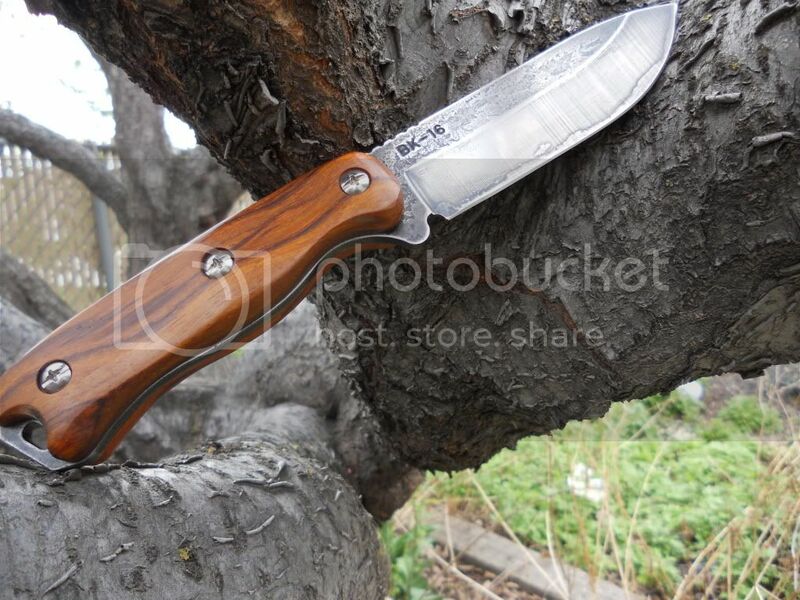 etc... Ive seen some of these knives selling for hundreds of dollars and I just cant afford that at this time. Yeah, you can easily sand off a regular vinegar/bbq sauce/mustard, etc patina. But something like a blue/bleach or PCB etch, on the other hand, is permanent. I've done a few of these. They look cool, but you can't change them once they're done. You can patina or etch the carbon steel Moras. My Companion has a nice steak and chicken patina going right now. Anything carbon steel. If you want a bigger, inexpensive knife to practice on, the Cold Steel GI tanto can be had for $25. Here's what some of my etched knives look like for comparison with the regular patina. turntail, sea6ear, Torrin and 2 others like this. There are two ways I've used it to produce a good etch...using paint as a mask, and a plain ol' Sharpie marker. The first method takes time, but you get much crisper results. It seems counter-intuitive, but after stripping off the factory finish, wipe the surface down with alcohol, let dry, and spray paint it in an even coat of flat black. Then, use a pencil to draw on your design, or a burnishing tool to transfer a traced design to your work. Then you can use an awl (or nail, or anything with a fine, sharp point) to scratch the design into the paint, exposing the bare metal beneath. Conversely, you can scratch away all the paint except the design for a reverse effect. Once you're satisfied, "soak" the piece in nitric...warming up the acid accelerates the process somewhat. For carbon steel, I typically get good results at 30 mins, but if your design edges are clean you can let it go a bit for a very deep, refined etch. Once you're happy with it, run the work under hot, soapy water to neutralize it...the paint mask should just flake off at this point. If not, a run under a buffer will take care of it. Obviously this can take some time, but the end result is well worth it. The other method, and my favorite because of the character it gives the work, is simply using a black Sharpie marker. Just draw on a design free-hand, whatever you want. If you mess up or want to change it, use a dry-erase marker over the Sharpie ink to make it wet just long enough to wipe off. In this way, the Sharpie ink becomes your mask. Since the thickness of the ink and the edges will vary as you draw, it will be enhanced in the finished piece--a very good method if you want to artificially antique anything. Give it the acid bath, neutralize and scrub as before, and you have some impressive results. You can also layer designs this way, making subsequent etches deeper--the key is to just experiment. Again, since this is a strong acid, you must use all precautions...splash goggles, gloves, etc. It's also important to experiment either on scrap or an unseen part of whatever you're working on. Not leaving something in the etchant is annoying, while leaving it too long can be disastrous. sea6ear and Torrin like this. Thanx for all the help fellas. 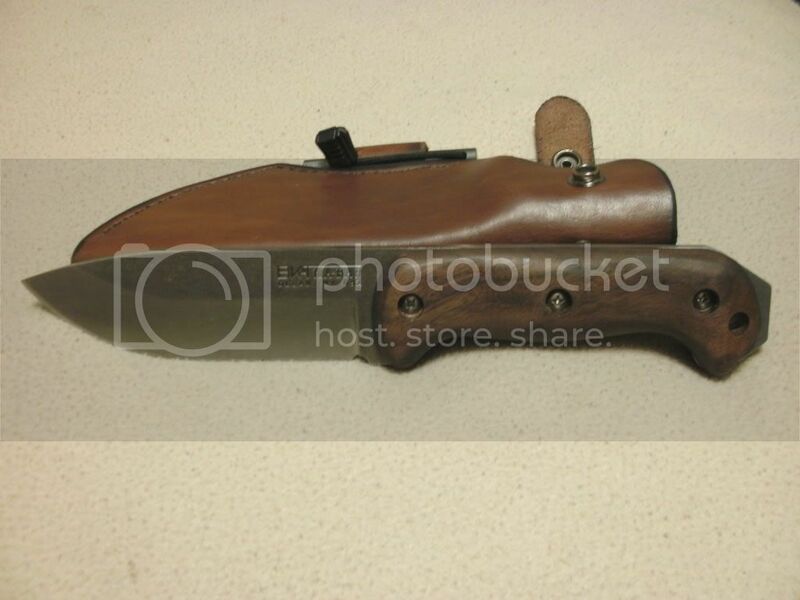 I cant wait to get started on my own project and I will post some pics of course. Time is nota friend of mine these days but may be a good winter project as things start to slow down. 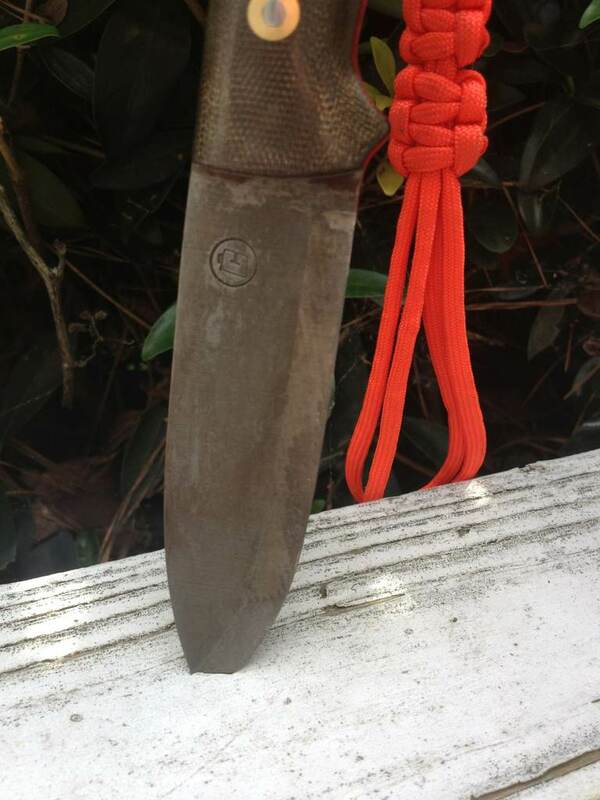 I did a tomato patina on my mora, and it turned out really nice, but decided to let nature run it's course on my BK2. Walnut scales, a good leather sheath and mineral oil are my rust preventitive measures. turntail and bluecow like this. Boroffski, I really like those scales on the BK2. If you dont mind, where did you get those and how much does something like those run? I got them for $40 from ebay, a lil shaping/sanding and a mineral oil rubdown, and they are perfect. They were made from recycled walnut flooring and came oversized and somewhat rough. Some would not like paying $40 and then putting an hours work into them, but I enoyed it and they turned out great. 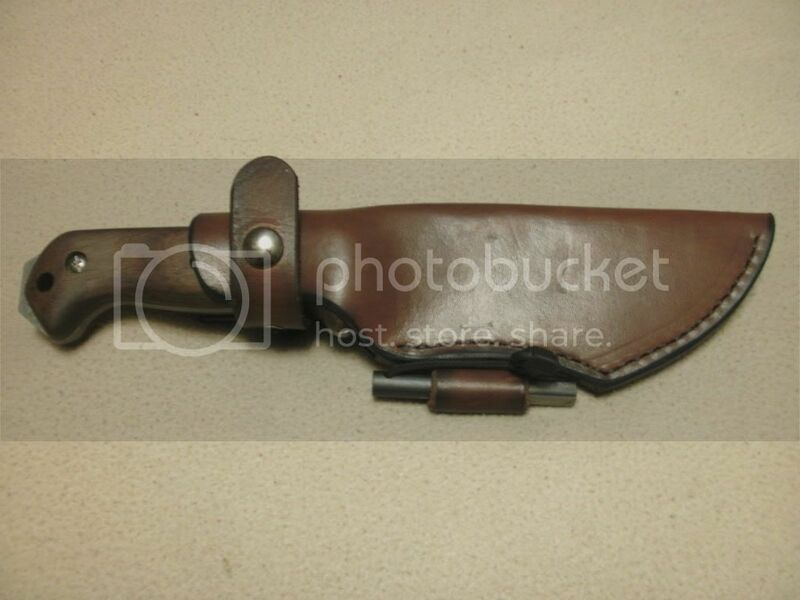 I must give a plug to Skystorm Leather for the sheath and firesteel while I'm at it. Also ebay. A strong second on the apple cider vinegar boil technique. Do you put the blade directly in the boiling vinegar? or boiling hot in some sort of container? How long for a nice dark patina? Any pics of finished product? Big thumbs up to Tommythewho and Skystorm. I've got several products from both men, and they are excellent. I just thought of a knife I want to do this on but I need some advise. 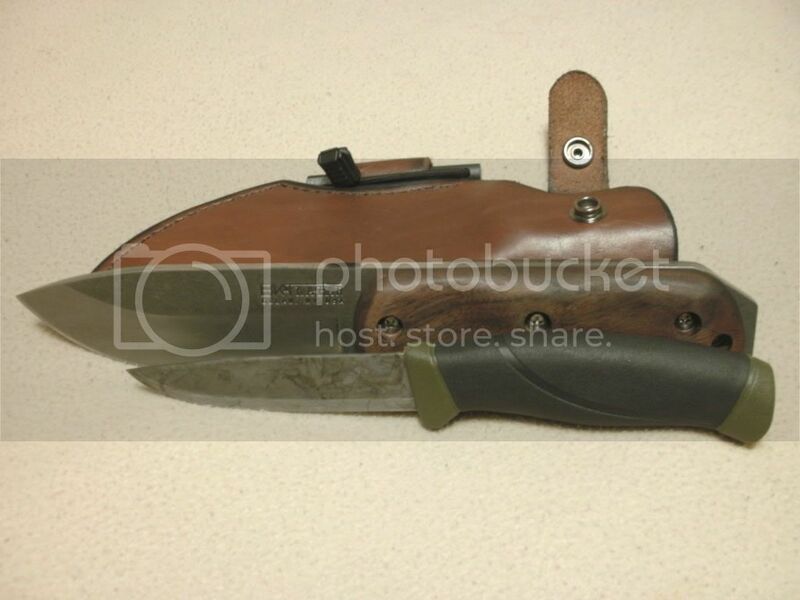 It is a custom made knife made from a file. I left it in the leather sheath and it starter to rust a bit, just some surface rust. It has a crown deer stag handle, burnt stag. If I decide on the boiling cider vinegar or an other method, how can I protect the stag handle? I may try to do it this weekend and post some pics. I'd try wrapping it in a zip lock secured with blue tape or something and then suspending the knife over the vinegar rather than submerging the whole thing. I just got done doing a forced Vinegar Patina on my BK2 but after reading the comments above I might try the boiled method for a darker finish. turntail and Redneck Bear like this. I soak my entire knife overnight in lemon juice. If not overnight, then for a minimum of three hours. Does that give a nice dark patina? 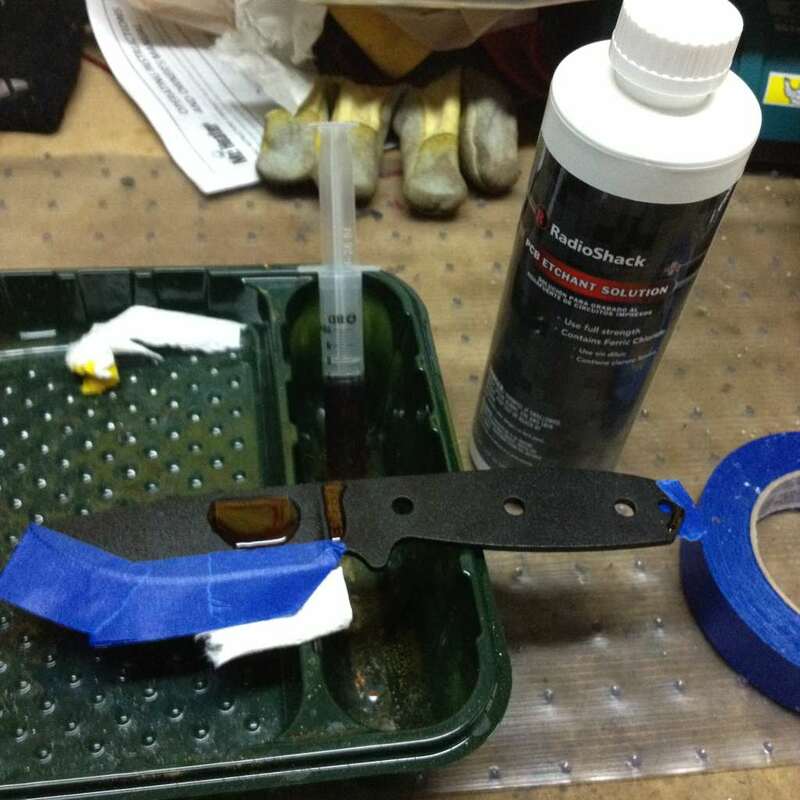 I like doing it because if i don't like it i can buff it out, and it does protect the blade to a certain extent from bad rust. Typically it only requires me to strop my knife after i have put a patina on it. Oh and this is only effective on Carbon steel blades. And sometimes i let the patina form naturally by cutting acidic food such as tomatoes, pineapple, bananas, onions and potatoes. He always took the scales off and submerged the entire blade into the boiling vinegar. Took it off after a few minutes, and let it soak till the desired color was achieved. It gives a very, very dark solid black patina that wears well. It generally does a dark gray color. One forged O-1 knife it turned a mirror-like black. I just did one with a knife in S-7 steel and it turned out a light gray. My non-scientific experiences seem to point to higher carbon content plus longer soak equals darker color. I forced patina on my BK 2 and Mora Companion with fresh lemon, Sriracha, and yellow mustard. A big hodgepodge of acidic crud. Came out nice. I must've missed a spot though, I noticed a line of rust on the "BK2" side where the grind meets the handle. Photobucket isn't working, sorry for the small thumbnails. demonslaer, that blade is sick! I really like that. Turned out very unique. I just want to say THANX AGAIN to all you helpful folks. I cant wait to try this. I tried the white vinegar patina on a stripped BK10 and my ML Knives kephart by soaking paper towels in vinegar and wrapping the blades with them for about 15-20 minutes. This morning when I checked on them both blades had ugly rust areas along with the patina. What did I do wrong? When you say ugly rust I assume you mean a reddish color rust, yes? If so, just lightly rub/sand that off and continue with the vinegar wrap. I'm guessing that means its reacting to the presence of liquid without the protection of a patina yet. I've seen that a time or two and just kept going with the patina, then when I lightly scrub/sand to get any loose rust off that's what comes off first. I started a patina on my Woodcrafter this morning while making bacon. Mmmmm....bacon. turntail, Torrin and Redneck Bear like this. I had tiger stripes on my blade, but yours has...depth and character. The bleach and cold blue method wroks very well..If you time it right you can get different looks and surface texture not just color. Though it a permanent change, it wont wear off like vinegar etches will..
thanks for the kind words. that was the 1st knife I've done .